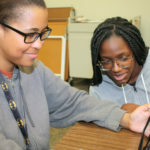 Providence Public Library (PPL) tapped into federal workforce funding by connecting with local youth centers to implement a summer learning and earning program. Utilizing library resources and working with an array of community partners proved to be a winning combination for serving youth preparing for employment. Beginning in the summer of 2017, PPL partnered with two state youth centers (CCAP: Comprehensive Community Action Program and CAPP: Community Action Partnership of Providence) to serve as a work placement site for 40 youth, between the ages of 14-24. PPL took their successful Teen Squad: My City, My Place which was beta tested during Spring Break 2017 and expanded it to become a summer work project. The program has continued to evolve through 2018. My City, My Place was originally funded in 2016 through a grant from Digital Media Learning (DML). My City, My Place consists of four playlists for learning that integrate history, technology, and career skill development for the hospitality and tourism industry. Through the playlists, youth learned photo/video editing skills, beginner and advanced PowerPoint, how to receive and implement feedback, and presentation skills. They had the opportunity to interact with tourism/hospitality professionals, learn about different career paths and how to be successful within the industry as potential employees. Youth also earned digital badges to show that they completed each playlist and learned the prerequisite workforce preparedness skills.